If you are embarking on a large scale tiling project you will need tile expansion joints to ensure a long lasting and professional finish. 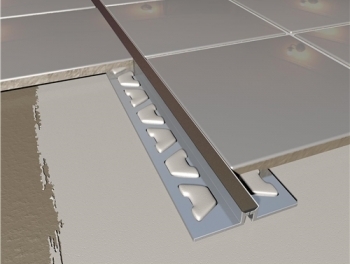 All tiled surfaces that are larger than 20 square metres require tile expansion joints to protect the tiles from the internal stresses that occur due to natural tile expansion and contraction. Without using a tile expansion joint, the tiled surface will suffer from damage over time and the appearance of your wall or floor will be spoiled. Tile expansions and contractions occur naturally at different rates within the various components of the tile, including the tile itself together with the adhesives and substrates. Changes in conditions, for example increases in moisture or higher or lower temperatures, result in tile expansions and contractions that put stress on the tiles and eventually result in damage. Using tile expansion joints deflects these internal stresses and creates a flawless professional finish that will be durable and long lasting. Here at Tiles Direct we stock both PVC and metal tile expansion joints to suit the needs of every large scale tiling project. 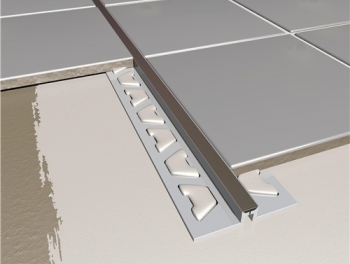 Whether you are tiling a large expanse of wall or floor, we have the perfect expansion joint to meet your requirements. 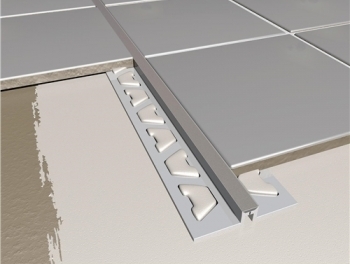 Our PVC tile movement joints are high quality yet low cost and represent excellent value for money. We even supply two different colours so that you can find one that creates the right look to complement your tiles. With a choice of either soft grey or stylish black, it couldn't be easier to create the professional finish you've been dreaming of. Our metal movement joints are extremely hard wearing while also fitting into your budget. We offer a choice of either aluminium or stainless steel joints and we even have two different colours that will perfectly complement tiles and grout of any shade. Whether you opt for black or grey, you will find that our metal expansion joints can be used on either walls or floors, and can even be used with underfloor heating systems when applied with an appropriate adhesive. Our stainless steel movement joints are all commercial grade and are even suitable for use in areas that are fully submerged in water. 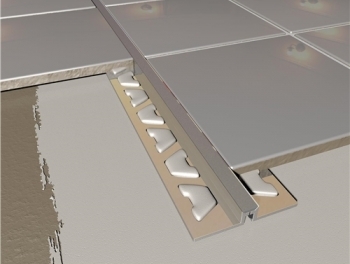 Visit us today at Tiles Direct and discover our choice of tile expansion joints. We're confident that you can find the ideal product that will not only make your large scale tiling project look professional but also long lasting.